Learn to walk before you can ride! Balance bikes have no pedals and no brakes, so children can learn the most important aspect of riding a bike-learning to balance on two wheels! 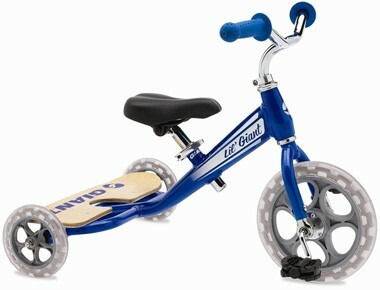 Balance bikes are rapidly gaining in popularity as one of the best ways to teach children to ride. Many kids bikes with small wheels are fitted with stabilisers from new, although you can buy stabilisers to retrofit to a bike if you need them. These bikes have pedals and may also come with a single lever brake, or a coaster (back pedal) brake. Children learn the co-ordinated action of pedalling and steering a two wheeled bike, without having to balance at the same time. For very young children who may have difficulty balancing, a trike teaches children the action of pedalling a bike before learning to balance. There are no brakes, no gears and no chains to contend with. Because of the popularity of balance bikes, and the changing attitudes towards teaching children to balance before they can pedal, tricycles are becoming harder to find and are generally not as well recommended as the other options. 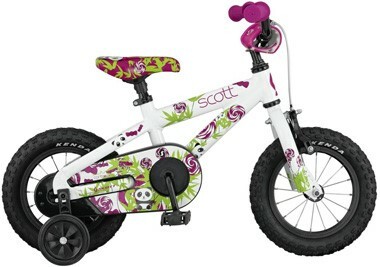 Which size kids/junior bike do I need? Just like adult bikes, a cheap kids bike will be made from a very basic, and very heavy grade of mild steel. This makes the bike difficult for small children to handle if they drop it, or want to perform a more complex manoeuvre. An aluminium frame is lighter and typically stronger than a cheap steel frame, giving the best of both worlds. A fun and exciting colour scheme can be hugely instrumental in helping children fall in love with cycling. Thankfully there are a multitude of styles and themes available. If you're buying a bike as a Christmas or Birthday surprise, try asking your children what their favourite colour is, or find out what type of bike their friends have and which friend has the nicest bike. Buying a cheap kids bike from the supermarket might sound appealing because "they'll grow out of it and it won't be worth anything in a few months." Cheap bikes with poor quality parts can not only be an accident risk, they will indeed lose most of their value after just a few short months. 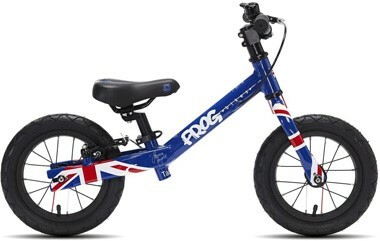 Reputable brands like Frog Bikes offer a 'Leapfrog' scheme, promoting the resale of 2nd hand kids bikes, helping them maintain their value. A well-made and reliable bike will also last much longer, and can be passed down to younger siblings when the time comes.